Undivided back, used postcard. 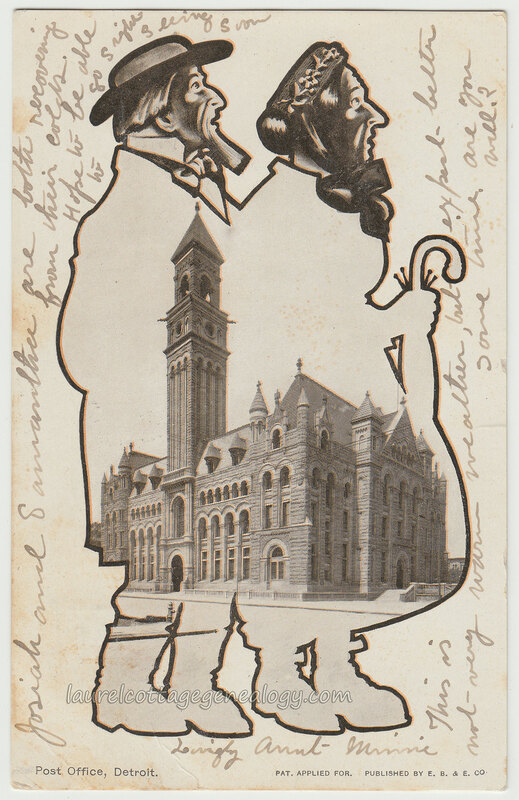 Postmarked March 26, 1908 from Chesaning, Michigan. Publisher: E. B. & E. Co.
A slightly comical card of an illustrated older couple, maybe they live in the country or city outskirts, and have come to downtown Detroit. Within their outline is a photo (slightly distorted probably to fit in the frame, in a fun-house type of way 😉 check out the tower) of the old Federal Building and Post Office at the Northwestern corner of Shelby and W. Fort streets. 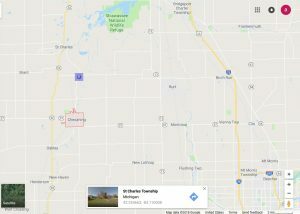 Fergus, Michigan is a “locale” located north of Chesaning, in St. Charles Township, Saginaw County, in the vicinity of Fergus and McKeighan roads (purple marker on map below). It was a station on the Michigan Central Railroad and had a post office that closed in 1933. 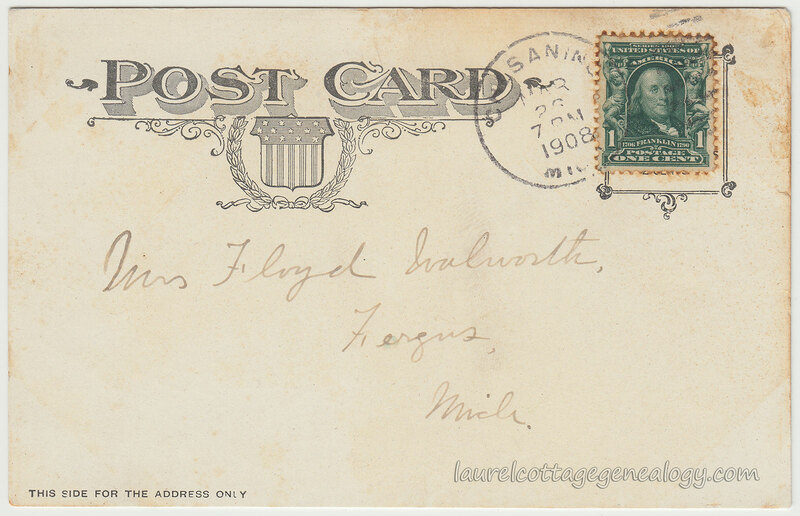 Without a doubt (we got thrown off track at first by another possibility) the recipient of this postcard was Myrtle G. Spencer, daughter of G. H. Spencer and Emma Burrows, who had married Floyd E. Walworth on August 1, 1907 in Corunna, Saginaw County, MI. Myrtle was about age 22 when she married Floyd, but was first married to John R. Wegert (June 18, 1902 in St. Charles, MI). Floyd was about age 29 at the time of marriage and both he and his bride were residents of Fergus, MI and native Michiganders. His parents were Matthew Walworth and Lucy Merrill. Floyd’s occupation was live stock shipper and Myrtle’s was music teacher. The sender of this card, Aunt Minnie, was not yet found in records. She mentions family members Josiah and Samantha, names which we expected would jump out at us from old records, but no; a more time-consuming search would be needed as far as who’s who for Myrtle or Floyd’s possible aunts. 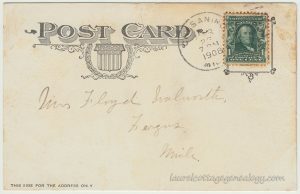 Last but not least, according to Publishers’ Trademarks Identified by Walter E. Corson, the postcard publisher E. B. & E. Company was Ely, Boynton & Ely of Detroit. Sources: Austin, Dan. “Federal Building.” historicdetroit.org. (accessed September 15, 2018). St. Charles Township, Michigan. n.d. https://en.wikipedia.org/wiki/St._Charles_Township,_Michigan (accessed September 9, 2018). Chesaning. Google Maps. google.com (accessed September 9, 2018). “Michigan Marriages, 1868-1925”, database with images, FamilySearch (https://familysearch.org/ark:/61903/1:1:NQQ4-2ZB : 9 July 2018), John R. Wegert and Myrtle G. Spencer, 1902. Michigan Department of Community Health, Division of Vital Records and Health Statistics; Lansing, MI, USA; Michigan, Marriage Records, 1867-1952; Film: 93; Film Description: 1907 Montcalm – 1907 Wayne. Corson, Walter E. Publishers’ Trademarks Identified. Ed. James Lewis Lowe. Norwood, PA: 1993. (print). This entry was posted in Buildings, Couples, Hats, Humorous, People, Postcards Used, Shaped Borders, Umbrellas and Parasols, Undivided Back and tagged Floyd E. Walworth and Myrtle G. Spencer Michigan genealogy old postcards family history by Annieoakley. Bookmark the permalink.